The tattoo as a memorial for a deceased loved one is probably one of the most poignant forms of tattoo a person can have done. It’s an outright commitment to remembering the deceased person and honouring them for the role they played in people’s lives. I personally believe it to be one of the best, if not the best method for creating a bond between the deceased and the living. No doubt it’s got to be a great comfort to the person who has their deceased loved one’s name or image tattooed on their body. As many times as I have seen or heard of someone getting a tattoo of a family member or friend who has passed away, I’ve never been aware of someone who was responsible for another person’s death getting a tattooed reminder of that person. I’m sure that I’m not alone in thinking that such an act just doesn’t sit quite right, even if the intention was genuine. I think something like this can do more harm than good. 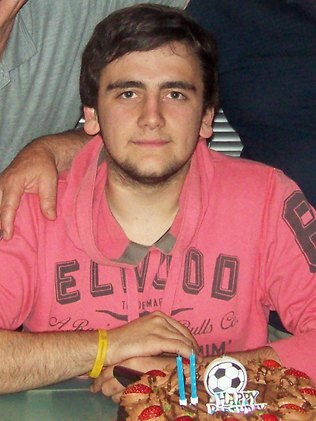 20 year-old Australian George Petrou died in May of 2009 while being driven home by his best friend, Petros Ttofari. Ttofari had been driving his car at speeds “upwards” of 85km/h in a 50km/hr zone when he crashed into a pole, killing Petrou. Grieving in his own way for his friend, Ttofari had Petrou’s name tattooed on to his leg. This act however, did not sit well with Petrou’s family. ‘”He can take the tattoo of my son’s name off his leg,” she said. “He doesn’t deserve it. I don’t want my son anywhere near him. Meanwhile, Ttofari has been sentenced to 2 years in prison for the incident, with a non-parole term of 10 months.